Bangladesh and Sri Lanka are growing faster then Pakistan. Number of textle units are relocated to Bangladesh and Sri Lanka in last few years, in next post i will try to write success story of Sri Lanka too. Time has come to learn from our neighbor nations. Pakistan has more 40 million youth who can bring such success to us too. It is a story built up over the last two and a half decades. It is a story of success, of winning against all odds. It is a story of a nation, which has vowed to overcome all the barriers with limited resources and immense passion. It is not a story of �Veni Vidi Vici.� Rather, it is a tale of toil, a tale of rising, of starting small and finally finding glory. Yes, my dear readers, I am talking about the success story of Bangladesh apparel sector. The sector which started with contributing only 1.1% of the country�s total exports in 1982-83, ended up earning more than $11 billion in the fiscal year 2010-11. This is the sector in which more than two million people are employed, mostly women. This is the engine of our economy and the major source of earning foreign exchange. The growth story of our apparel sector is simply spellbinding. In 1983-84, the total apparel exports of Bangladesh were only $31.57 million, 3.9% of total exports. During this period there were only 134 factories, which employed around 400,000 workers. The breakthrough occurred during 1985-86, when the number of factories increased to 594 and volume of export grew to $131.5 million. In FY90 it became a $624 million industry with a share of 41% of total exports. During 1985-90, the sector grew at a cumulative average growth rate (CAGR) of 40%. The earnings from this sector crossed the billion-dollar mark in FY92, with a total export of $1.18 billion. In FY95, the share of apparel export increased to 64% of total exports and earnings doubled to $2.2 billion. The industry grew at CAGR of 29% during 1990-95. Within the next five years, the export proceeds from this sector again doubled to $4.35 billion and the share of apparel export to total exports grew to 76%. Since then, the apparel sector has continued to contribute more than 75% of total exports. Several internal and external factors contributed to the phenomenal growth of the RMG sector. The key factor behind the growth was the quota regime under the Multi-Fibre Arrangement (MFA). The General System of Preferences (GSP) facilities and RoO (Rules of Origin) offered by the developed nations also helped Bangladesh to accelerate its export. In short, MFA provided market protection for Bangladesh, whereas GSP facilities offered preferential treatment and market access opportunities in developed economies. Moreover, the apparel industry also received support from the government, which included measures like duty drawback facilities, tax holidays, cash assistance, income tax rebate, creation of export processing zones, zero tariff on machinery inputs, rebate on freight and power rate, bonded warehouse facilities, provision of import under back-to-back letters of credit, loans at concessional rate, export development fund, etc. Finally, Bangladesh possessed a number of comparative advantages, like low labour costs, compared to other Asian economies, growing share of local inputs (particularly in knit fabrics) and competence in mass-produced basic garments (such as knit cotton and woven cotton products). Meanwhile, the sector survived the MFA phase-out at the end of 2004, despite fierce competition from neighbouring countries. However, the success story continued. Post MFA phase-out, export earnings from the apparel sector increased to $6.4 billion in FY05, $7.9 billion in FY06, and crossed the $10 billion mark in FY08. It was apprehended that, post MFA phase-out, about 30% to 40% of garment factories would close down. On the contrary, the number of factories increased from 4,000 in FY04 to 4,740 in FY08, and employment generation increased from 2 million to 2.5 million. The journey of this growth story was not smooth. The entrepreneurs of the apparel sector faced tremendous constraints in terms of power and gas supply. Political instability, frequent hartals (strikes), poor port facility, and labour unrest created longer lead time, which became another barrier in competing with neighbouring nations. Amidst all the constraints, the RMG entrepreneurs lived up to the buyers� expectations of reduced price margin, improved compliance standards, and quality assurance. There were also significant investments in backward integration. The comparative advantage of low labour cost also attracted foreign direct investment. As a result, both backward and forward linkage industry flourished in Bangladesh. Currently, the backward industry is able to meet up to 85% of the demand for the raw materials required for knitwear export, which significantly contributed to the country�s growth of apparel export and knitwear exports emerged as a number one export item due to increased investments in backward linkages. Since 2005, in the quota-free regime, the earnings from apparel export grew at the CAGR of 18.6%. There has been vast progress in terms of size and scale, capacity development, establishment of forward and backward linkages, etc. However, there are some constraints warranting all out attention too. If this growth rate is sustained, Bangladesh is likely to cross $25 billion in earnings from apparel export in the next five years. Now, the question is, can the growth rate be sustained in future? Will we be able to survive another crisis like the global economic slowdown and financial turmoil of Western countries as we had survived the challenge of MFA phase-out? The economic slowdown in the US and EU, and the fear of recession, has hurt other economies of the world as well. The export-reliant countries have been hit hard by the financial turmoil. Bangladesh is also an export-reliant country and the export earning from apparel sector is considered as one of the driving engines of the country. Of the total apparel exports, 30% goes to the US, more the 60% goes to the EU countries, and the rest goes to other countries. In FY08, the total export receipts from woven garments was $5.16 billion, out of which $2.37 billion came from EU, and $2.41 billion came from the US. Knitwear export in FY08 was $5.53 billion, of which about 79% was exported to European countries and around 15% went to the US. In a nutshell, around 90% of garment exports goes directly to the US and European countries, which are currently facing economic slowdown. The slowdown in these economies may decrease the demand of apparel imports from our country due to the fall in purchasing power of the consumers. The possible negative effects on Bangladesh may come in the form of decrease in export orders. The huge concentration of the apparel sector (76% of the country�s total exports) in the country�s export basket exposes us to an even bigger challenge of survival and sustenance. However, we all know that the risk of falling export orders from Bangladesh is largely mitigated by the fact that Bangladesh exports mostly basic and low-end apparels and related accessories, where the income elasticity is lower than that in the high price segment. So far, apparel exports have retained robust growth, and it is expected that the current slowdown will not have much adverse impact on that. If we look at the data published by the US Department of Commerce, the apparel import figures confirm the assumption. The growth trend during the peak period (from June to September) was positive. 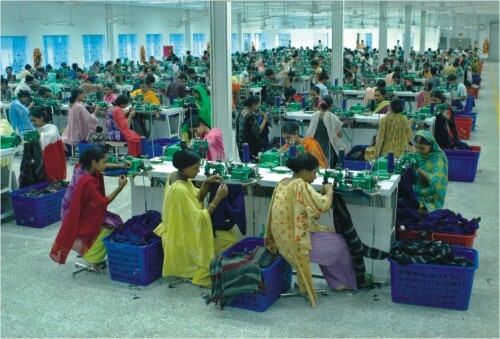 As of September 2008, the total apparel imports of the US from Bangladesh was about $2.6 billion, which is 8.6% growth over the corresponding period of the previous year. As of September 2008, the total apparel import by the US was $54.27 billion, which is a decline of 3.3% compared to September 2007. The total apparel export of China to the US until September 2008 was $16.9 billion, which is 31% of total apparel import of the US. However, the total import from China has declined by 2.2% compared to September 2007, which was $17.29 billion. Among the other Asian countries, total apparel import from Vietnam was $3.9 billion as of September 2008, which registered a growth of 22.9% over the corresponding period of the previous year. Imports from Cambodia, Sri Lanka, Pakistan and India fell by 0.11%, 9.3%, 2.2%, and 4.1% respectively in September 2008 compared to the corresponding period of September 2007. As of September 2008, Bangladesh is the fifth largest apparel exporter to the US after China, Vietnam, Mexico ($3.07 billion) and Indonesia ($3.1 billion). India ($2.4 billion), Honduras ($1.9 billion), Cambodia ($1.8 billion), Thailand ($1.28 billion) and Hong Kong ($1.25 billion) are in sixth, seventh, eight, ninth, and tenth positions respectively. In the first quarter of 2007, total export by Vietnam, Indonesia, Bangladesh, India, Cambodia, Pakistan, Sri Lanka, and Thailand was $5.5 billion, which has increased to $6.2 billion in the third quarter of 2008. Among these countries, Vietnam has increased its share from 16% in Q107 to 25% in Q308. Indonesia�s share of export was stable in the range of 17% to 18% over quarters. Bangladesh contributed around 14% over the quarters to the total export of these eight economies, and increased its share to 15% in the last quarter. The share of apparel export from India fell significantly from 17% in Q107 to 10.9% Q308. The shares of Cambodia (10%-11%), Pakistan (7%), Thailand (7%-8%) and Sri Lanka (6%-7%) were stable over the quarters. The decline of Chinese apparel exports is definitely good news for Bangladesh. The Chinese apparel sector suffers from currency appreciation, increased labour wages, and rising cost of compliance with new regulations on working conditions. While we are eyeing the diverted business from China, we must assess to what extent we are increasing our market share. We must find out why Vietnam was able to grow by more than 22% by exporting to the US market from September 2007 to September 2008 while Bangladesh lagged behind. And we must not forget that Bangladesh has a very limited market share in the non-apparel/textiles export market, which is dominated by the neighbouring countries. Until September 2008, total non-apparel/textiles exports to the US by China were $7.5 billion, while India, Pakistan, Thailand, Indonesia and Vietnam exported $1.5 billion, $1.2 billion, $235 million, $170 million, and $150 million respectively. 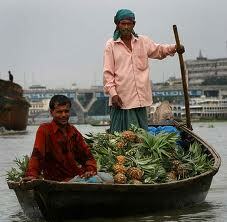 The total exports from Bangladesh were $75 million. Hence, even though China and India are losing market share in the apparel sector, they are far more competitively positioned in the textiles segment. Moreover, total exports from China are likely to surge from the first quarter of 2009, when restrictions will be lifted. Following the recent financial crisis, the currencies of Asian countries have substantially depreciated against the US dollar. In the past few months, the Indian rupee has depreciated over 20% against the US dollar. The Pakistani rupee depreciated by 25%, and the Vietnamese dong by 10% against the US dollar. More importantly, the central banks of these countries did not play any active role in currency depreciation; rather the regulatory authorities of these countries are concerned about currency depreciation because of withdrawal or decline of foreign capital investments from these countries. Similar is the case for South Korea, Malaysia and Singapore. On the flip side, export sectors of these countries will comparatively gain due to the fall in the value of the local currency. The key challenge for Bangladesh will be to compete against these countries with competitive exchange rates. Enhancing labour productivity: The greatest challenge for us is to constantly focus and enhance our efficiency and productivity. Enhancing productivity does not only mean cost reduction, but also requires greater vision and enforcement of that vision in an effective manner. One of the prime causes behind low labour productivity is the prevailing labour shortage in the apparel sector. It is reported by the BGMEA that the number of skilled manpower in the apparel sector has declined by 25%. The prime reason behind this is lack of institutional orientation. The apparel sector is the livelihood of more than 2.5 million people, but there is no training institution or certification program to develop the manpower. It is essential to upskill the labour force to derive optimum level of productivity and capacity utilisation. 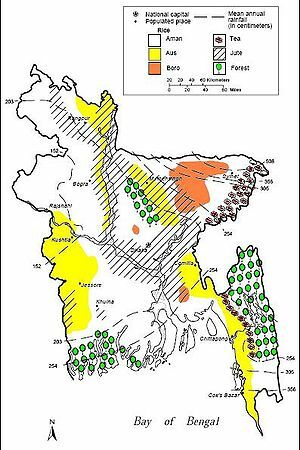 Furthermore, major shifts in production technologies are factors that may seriously affect the competitiveness of manufacturers in Bangladesh. RMG entrepreneurs of Bangladesh, therefore, should quickly embrace state of the art technologies. Innovation of new production tools/techniques/ equipment and plants may also be explored. Countering labour unrest: Every year, the apparel sector faces substantial productivity loss because of labour unrest, which results in production halt, missed shipment, and revenue loss. Many a time we have heard that there is foreign conspiracy working behind the labour unrest in our apparel sector to reduce its competitiveness. However, what measures have been taken by the owners to counter the problem? In Bangladesh, as per the minimum wage policy, a new worker draws only $24 per month. After working for three months, the worker gets to draw $29 to $36 a month, whereas a skilled worker gets paid around $45 a month. The last �Minimum Wage Policy� was revised in October 2006, when annual average inflation was 6.78% and food inflation was 7.95%. During FY09, the annual average inflation rate increased to 10% and food inflation rose to 12.5%, but we have not observed any wage revision. As a result, workers have started to migrate to China, Vietnam, and UAE, which are sourcing cheap labour from Bangladesh with relatively higher wages and benefits. Although our inward remittances will increase due to this, our comparative advantage is decreasing. Hence, the garment company owners need to offer a competitive, encouraging and engaging pay package to retain the workers and counter unrest. Addressing safety and security issues: The reason behind labour unrest is not only the low wage structure, but also the hazardous working conditions, insufficient safety and security measures, inadequate break time, irregular payment, forceful overtime, and many other factors. We have seen that hundreds of workers died due to collapse of factory buildings. The �Savar, Palashbari� incident is still vivid in our memories. There are frequent fires also. For how long will this continue? And why are the concerned authorities not taking any active measures to address the issue? We are speaking about enhancing labour productivity, but also recognise that productivity in our country�s apparel sector is low compared to neighbouring countries. However, productivity will not increase if we do not take any aggressive measures to address the safety and security issues. Improving supervisor-worker relationship: The relationship between supervisors and workers plays a key role in terms of productivity enhancement and maintaining overall discipline in the work place. While the �boss and subordinate� relationship is important in every industry, in the apparel sector it plays a major role and sometimes influences negatively. Incidents of exploitation and harassment of the workers by supervisors are common phenomena in the apparel sector, and this is more applicable to the female workers. The reason behind this is that there is always a gap between the owners and the workers. Supervisors play a �middle man� role, and owners are influenced by them. The absence of job description, accountability and corporate governance hamper the worker-owner relationship. Identifying new destinations: With 76% contribution to the country�s export basket, the apparel sector is vulnerable to any possible downturn in major export destinations. It is also susceptible to the economic, political and regulatory risks of the US and the EU since 90% of apparel export flows to these regions. The other important export destinations are: Canada, Japan, Australia, etc. In FY08, apparel export to Canada, Mexico, Australia and South Africa was $468 million, $61 million, $22 million, and $21 million respectively. Within Asia, Bangladesh exported $20 million to Hong Kong, $15 million to Singapore, and $10 million to China. These are all relatively new markets for Bangladesh, and efforts to enhance our trade share should continue. However, it is important to remember that reaching new destinations is also closely linked with capacity. Hence, capacity development and proper utilisation is also very important. Besides, Bangladesh is yet to derive benefits from the South Asia Free Trade Agreement. In most cases, South Asian countries have homogenous exportable items, which makes export opportunities even thinner. Bangladesh faces challenges in exporting apparel to India since RMG is a �sensitive� import item for India. In FY08, total export from Bangladesh to other Saarc countries was only $7 million, out of which export to India was $5 million, followed by Pakistan $700,000, Nepal $640,000, and Sri Lanka $610,000. At the micro-level, entrepreneurs in the apparel sector must analyse their commercial structures. They have to examine their overall business portfolio in terms of destination mix and the strength of their buyers, and should conduct an in-depth analysis of the buyers� main revenue and cost streams. If possible, the owners should also find out whether their cash flow depends on volatile economic sectors like real estate or sale of luxury items, which, in turn, may affect the buyers� overall businesses. If any such impacts are found, the entrepreneurs should consider diversification of their buyer base. Developing second-tier management: In most cases, the management control of the factories is limited within the family members of the owners, and in many cases it is just a one-man show. As a result, the overall business suffers from key man risk as well as capacity constraints. The owners of the RMG factories must make an effort to develop a second-tier management team, especially in the large apparel corporates. Given the global dynamics, it is high time to implement corporate culture and practices in the apparel sector, which requires developing human resources, enhancing corporate governance, decentralising decision making authority and empowering people. This will translate into enhancement of accountability and time saving and, more importantly, the second-tier management team can bridge the gap between the workers and owners, which will help further in improving industrial relationships and relieving the workers from harassment to a great extent.